Great news, Lagwagon are on tour soon! Now there's no racist, sexist, homophobic or violent material in Beat Motel so I'm not sure what offended them! 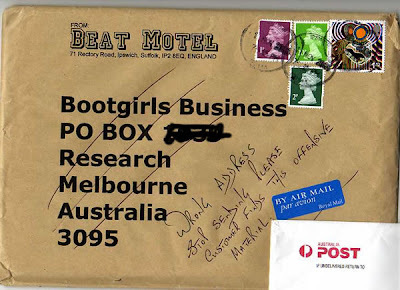 At least they were kind enough to send it back, I was thinking of putting it in a post box with address unknown written on it to ping it back to Oz, and see if I could instigate some sort of global game of zine ping pong! Stretch Arm Strong will be returning to Europe to do a full tour of the United Kingdom in support of their new album, “Free At Last”. To help spread the word on the tour and their new album, “Free At Last.” Stretch Arm Strong will be recruiting street teamers to distribute flyers and posters throughout the UK. Interested parties can head to www.stretcharmstrong.net or www.weputoutrecords.com to sign up. In stateside news, after positive feedback on Fuse’s Oven Fresh program, Stretch Arm Strong’s new video “The Sounds of Names Dropping” was added this week to Steven’s Untitled Rock Show. The show, which airs 4pm Mon-Friday PST, has featured such bands as Fall Out Boy, Thrice, Coheed and Cambria and many, many more. It’s an honor to have the Stretch boys in such great company. 2 – in control panel go to printers, then right click on the printer and make sure it isn’t set to ‘work offline’. This sometimes happens when the network goes down, Windows in it’s infinite wisdom decided to disconnect from the printer. If there is a tick next to ‘work offline’ then simply click it and it will disappear. 3 – There might be jobs stuck in the print queue. Go to control panel, printers, then double click on your printer and a box will pop up showing the jobs the printer is currently processing. If there are loads of jobs in there then clear them by going up to ‘Printer’ on the menu bar then click on ‘Cancel all Documents’. This may take some time. Also try this on the machine that the printer is physically connected to. The ‘new mail’ popup box has never been that reliable, it clashes slightly with the junk mail filters. When a message comes in the popup box appears to pop up no matter what the message is. If outlook as identified this email as being junk then it will remove it to the junk folder. This means that when you click ‘yes’ then you’ll get the next message along in the inbox. This is a similar bug to the one that leaves the ‘new mail’ yellow envelope in your system tray (the bit by the clock on your screen when you have already read the new message. My usual advice is to switch off the new mail notification if you are using outlook 2003 or later as you can set Outlook to notify you another way by a small message appearing at the bottom right of your screen. Another advantage of this method is that it also gives you the first few lines of the email so you can decide whether to deal with it immediately or leave it. The old new mail notification box that pops up will always be on top when it first pops up, disturbing the way you work. I've just got word from Fat Wreck Chords that Chixdiggit will indeed be touring the UK!